Here’s our beautiful fresh tree from last year. There’s a lot going on in this photo, but what I really wanted to point out to you is the “hat”. I usually top our Christmas tree with an angel, but I had a little fun last year placing my daughter’s black & grey long striped ski hat on top. You can’t see it here, but the hat has a little green jingle bell on the end. You’ll note that I also used my other daughter’s ice skates down at the bottom, and the tree is covered in flannel bows. 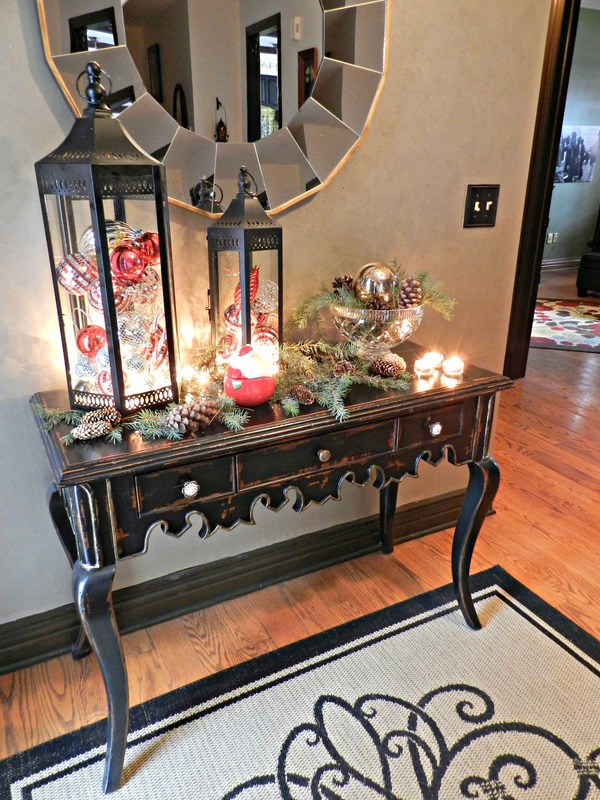 Together, with the scarf and furry tree skirt (made from faux fur fabric) it all gives off a cozy, fun vibe. A top hat, baseball hat (baseball lovers), chef hat, etc. would look great, too. It all depends on your family and what they love. I admit that I have only dressed our bedroom for Christmas once. Decorating the bedroom may sound like a lot of work when no one may see it, and it is…however, I had a lot of fun doing it just this once. Of course my husband thought I was nuts, and didn’t even realize he was sleeping with a wreath hanging over his head, but he went with it. Sylvia our rescue kitty, also didn’t seem to mind. 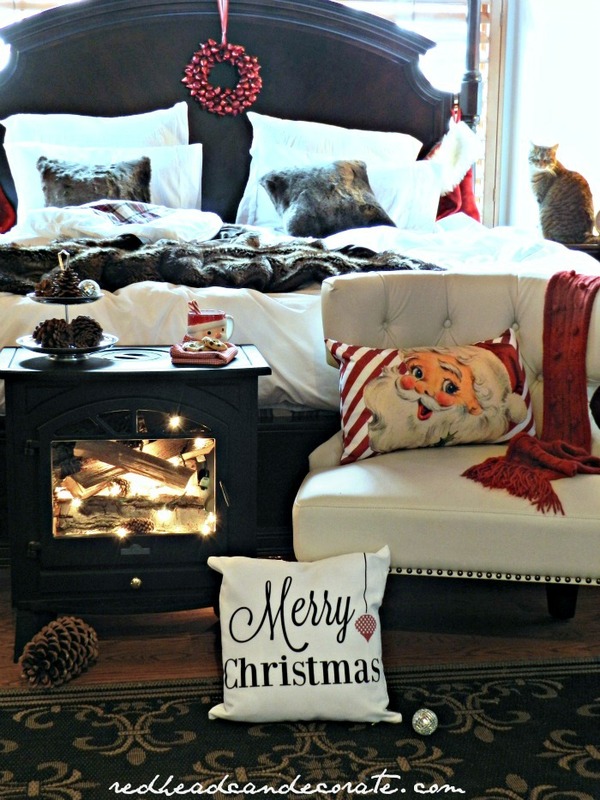 To make it extra cozy, I made a faux fireplace out of a broken electric wood burning fireplace, and the “Merry Christmas” pillow I designed myself (see below for more details). Thrift Stores are wonderful for inexpensive ornaments! You won’t believe this, but I made this “Gumdrop Tree” 3 years ago, and I still have it. The real gum drops still look great, too. 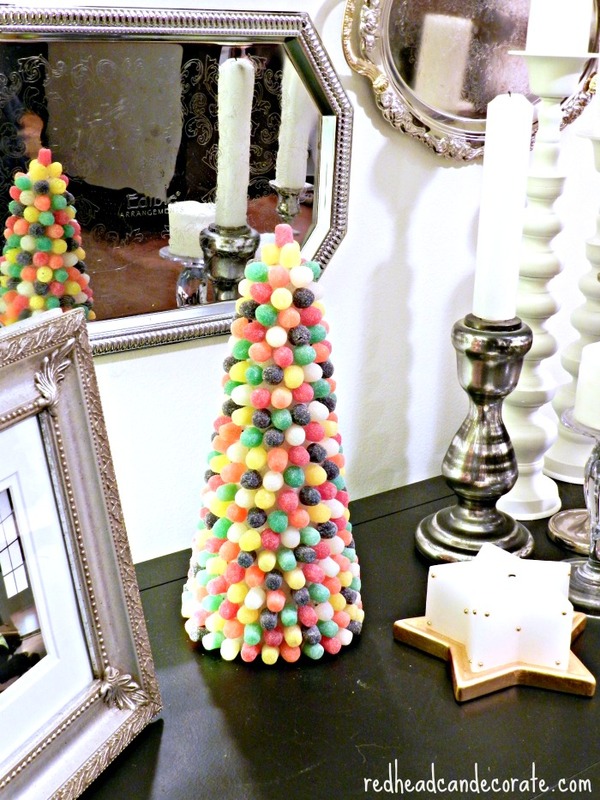 This “Gumdrop Tree” was so much fun to make with the kiddos. All I needed was a foam cone and tooth picks (gum drops were from the grocery store). I recently learned from a follower that her Mom uses pins to attach the gumdrops. Totally up to you how you would like to make one, but either way, just start at the bottom, and work your way up. Make sure the bottom is glued to a base when you work so you have leverage when pushing the gum drops in. Be sure to let the little kiddos know that these gum drops are not to be eaten. Lastly…this ” Christmas Swag Wreath” was absolutely free, folks. I know it’s a bit different than a traditional round wreath, but it still looks so beautiful. 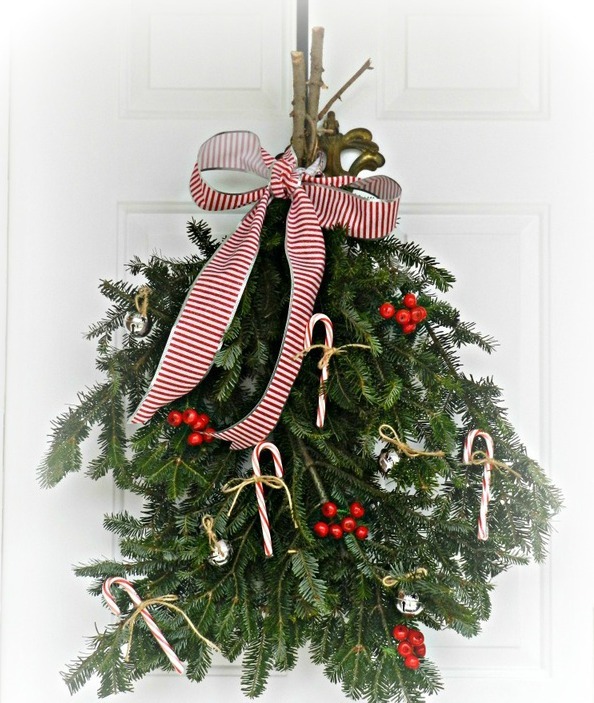 To assemble, just grab left over limbs off of the bottom of your Christmas tree (we always end up needing to trim ours), and gather at the top with twine. Tie tightly together, and leave some of the twine to hang it at the end. I decorated this right on our front door and tied the big ribbon on last. It was very simple with no glue required. Happy Thanksgiving, and see you next time! 16 Comments on "Five Cute Christmas Ideas"
Vanessa….very well said. I too was touched by your response. I loved Julie’s post today. Absolutely…I had planned to just have been busy. in her home. Why would you assume she didn’t have a Nativity just because it wasn’t under the tree. Your comment without knowing certainly makes you look very unchristianlike. 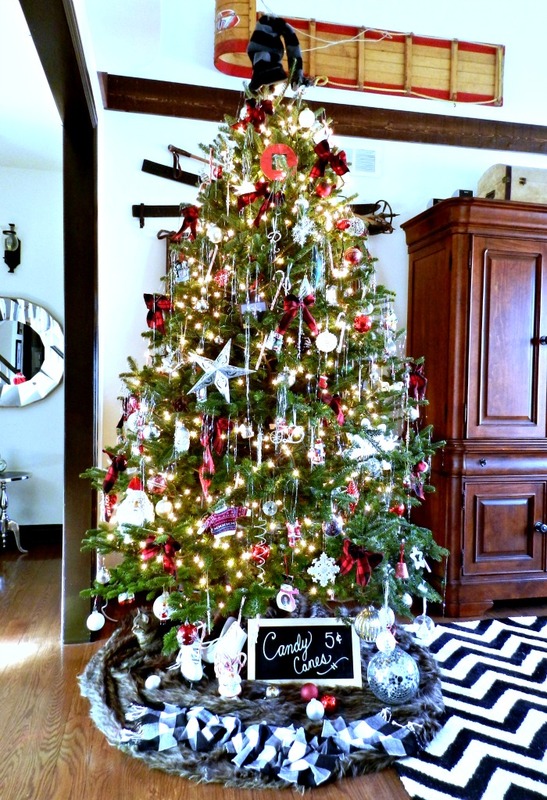 You should title this 5 ADORABLE Christmas ideas! I love these! Thank you for sharing. Thank you, Jean! So happy you enjoyed my ideas. Happy Thanksgiving! I’m loving each and every one of these creative ideas! I LOVE the personal mementos on your tree and think the hat topper is genius! Great post! Love your ideas, Julie! Everything looks beautiful. Beautiful ideas from someone who I know to be a beautiful soul, through and through. Such great inspiration! Thanks for the cute ideas Julie!